"Hodgkinson Design were briefed to extend this classic London townhouse and Vogue Kitchens were asked to supply and fit the kitchens. Creating an exciting contemporary home is a lifestyle analysis. Hodgkinson Design had to understand the limitations of the existing house, whilst the extension wanted to reflect the family’s desire for growth and change to satisfy their future requirements. Gaining a deeper understanding of how the family unit functions we, as designers, are able to direct our approach, the allocation of space, the ‘look and feel’, and of course budget and programme constraints. The side extension from the front is a quiet timber slatted flat roof extension that runs down the length of the house. 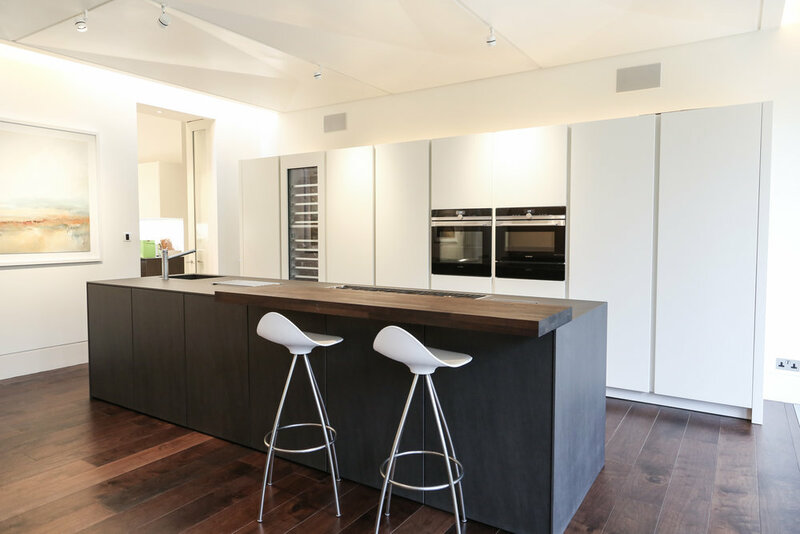 It was fundamental to creating the adjacent commodious living space for it provided a substantial amount of space for family washing and clothes drying machines, boilers, wine racks, and the usual family storage detritus. The main rear extension is a honey coloured stone and timber clad flat roofed contemporary extension, harmonising with the classic yellow brick of the original house. We created a generous multi functional space with large sliding full height windows to access the terrace and garden. The sculptural ceiling is an origami statement throwing light and shade across the room. We provided a main preparation and cooking kitchen, a dining area and a TV entertainment area. The gas fire sits underneath the TV, which is discreetly hidden behind sliding suede panels. Although architecturally different a language of warm hues, clean contemporary lines and sculptural elements connects both extensions to the existing house, and Vogue Kitchen’s Leicht units complement our style as the kitchen island made from bold porcelain stands confidently in the room of slate, brown and off white tones. 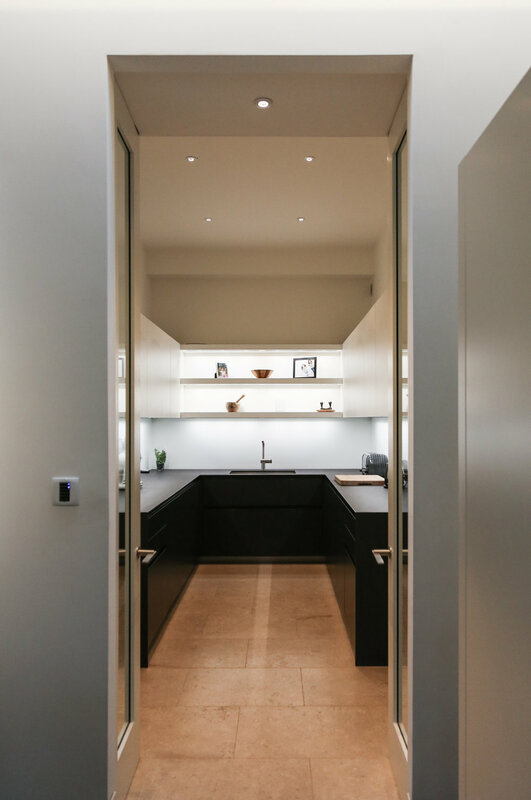 The house has two kitchens for modern life, the back for washing up and storage whilst the front becomes a prep and cook platform to ensure freedom of conversation between those cooking and those dining or lounging. This notion of an open plan room for living is both relaxed and contemporary yet undeniably stylish, similarly elements like the white panelled kitchen cupboards reflect the bespoke panelled ceiling unifying our most important concept: that art and technology should and can cohere alongside. The clients delighted with the result and we are all grateful to Vogue Kitchens for their contribution."